The lead time is 28-35 days. Every cabinet is cut to order to your specification - we do not carry any stock cabinets. If you need your cabinets sooner you can opt for our Premium Service. With the Premium Service your cabinets are processed as quickly as we can. Total time from order to delivery is typically 7-14 working days. We usually arrange courier delivery point to point. This ensures your cabinets are delivered direct from our workshop to your home without going through a distribution centre. You will also get the mobile number of the delivery driver meaning you can arrange a convenient delivery time. Delivery cost is around GBP60 and depends on size, weight and postcode. When delivering by van we aim to supply all components unwrapped. This works when using our own or trusted couriers and involves loading the panels into the van and strapping down with considerable force. Delivery logistics become more complicated when there are components longer than 2.5m. We have delivered to, amongst other places, Isle of Skye, Isle of Man, Portugal, Denmark. 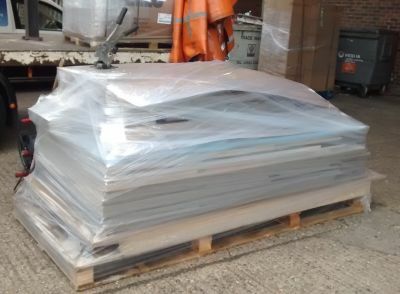 When delivering further afield our preferred delivery method is pallet. Usually this would be a 'double pallet' sized 2.4m by 1m. 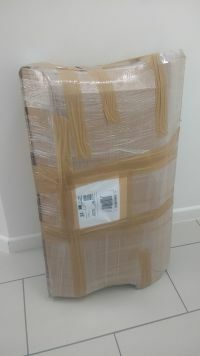 Often we will send out the fittings separately, usually by Parcelforce. Fittings packs are prepared in a separate location and then all parts for your project come together at the point of delivery. If the logistics of your project require a single delivery then we can organise that. However, because of various factors it is usually easier for us to deliver separately. One of those factors is, that because we are 100% bespoke, it is hard to stock every fitting. For example with Blum Movento drawer runners there are around 25 variations according to length and opening action and at around 5Kg per runner pair this is a large warehousing commitment which we leave to our suppliers! 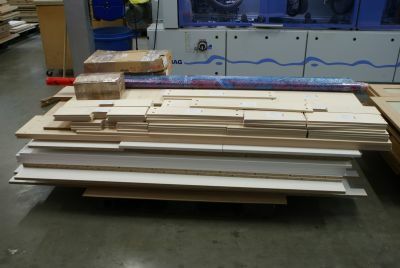 Dowels, screws, connectors, hinges etc. we keep in stock so if you run out for whatever reason we can send out for next day delivery.